How data is secured and stored. Organisations meeting the Farm Data Code of Practice agree to implement practices that provide farmers with utmost confidence that their data is safe and is managed appropriately. Update of Assessment and Review process to include the Review Panel. It is important to note that none of the actual disclosures and practices required of accredited organisations have been changed. 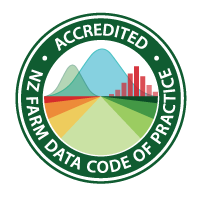 Farm Data Code of Practice is one of three connected initiatives to get data moving across the primary sector. Find out more about DataLinker and the Farm Data Standards here. The initiatives are funded by DairyNZ (through the Transforming the Dairy Value Chain programme), the Red Meat Profit Partnership and the Ministry of Primary Industries through the Primary Growth Partnership. The Farm Data Code of Practice is one of three data integration initiatives driven by the pastoral sector on behalf of farmers. The Farm Data Standards, and the Data Linker are complementary tools aimed at getting data moving across the primary sector - securely, efficiently and within a transparent framework. © New Zealand Farm Data Code of Practice. All rights reserved.